​Sharks are the Adolf Hitlers of the ocean, not because they are deranged, but because discussion about them causes people to shout and threaten one another with bodily harm. That’s what one LUSH cosmetics employee will do tomorrow in San Francisco. The grisly stunt is part of a global campaign to sell “shark fin soap,” a campaign backers hope will save the pelagic species, including here in South Florida — shark central. 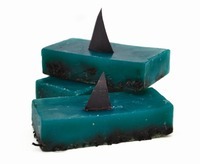 LUSH has partnered with activist group Shark Savers to sell “shark fin soap” in stores across the country this week (no shark fins included, see below for a picture). The goal is to not just to raise money to help protect the species — an estimated 100 million of which are killed every year — but to push for state-by-state bans on the shark fin trade, says LUSH campaign manager Brandi Halls. Shark “finning,” as the procedure is called, is illegal in Florida and the U.S., but state and national authorities say it still happens infrequently. As we reported in a feature earlier this summer, just about the only thing that shark fishermen and shark scientists agree on is that without the fin industry, shark fishing wouldn’t be an issue. In fact, LUSH’s shark campaign coincides with a push to pass AB 376, a bill to ban the possession or sale of shark fins has stalled in the California Senate. The legislation has proved controversial, especially in San Francisco, because shark fin soup is considered a delicacy by many Chinese-Americans. The Sunshine State may not have many Chinese-Americans, but it’s the epicenter of America’s shark fin industry. Thirty years after government encouragement and Steven Spielberg’s Jaws combined to create a boom in shark killing, South Florida remains home to roughly two-thirds of shark fishermen on the Atlantic or Gulf coasts. Halls says that LUSH will circulate a petition to ban shark fins in Florida at its Dadeland and Aventura mall locations. Thankfully, Newstead and her hooks will be across the coast in San Francisco. See below for another photo of what her performance will look like, but be aware: it’s pretty gross. ~ by FSVSF Admin on 23 August, 2011.